Concord believes that along with sustained economic performance, environmental and social stewardship is also a key factor for holistic business growth. We strive to integrate our business values and operations to meet the expectations of our stakeholders. Communities, ranging from those villages around its manufacturing facilities to those employed by its contractors and suppliers, are key stake holders and Concord is committed to ensuring that they benefit from the company’s presence in their neighborhood. 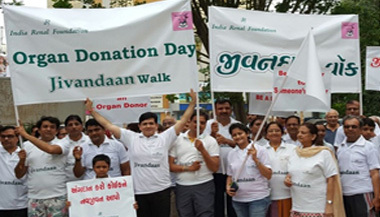 As a responsible Corporate Citizen, we aspire to undertake programs that can have a meaningful impact on the communities and the society at large. We seek to lead by example and are committed to the active involvement and participation of our employees in our corporate responsibility initiatives. Healthcare: Promoting Health care including Preventive Health care through awareness programs, health check-ups, provision of medicine & treatment facilities. 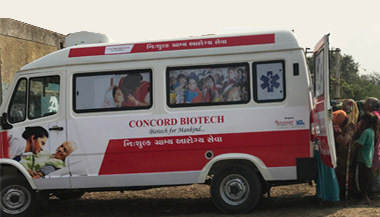 Concord has launched Mobile Medical Unit with the purpose of providing free medication and consultation at the doorstep of the residents of the nearby villages. Additionally regular health check up camps and blood donation camps are also organized. Education: Promoting education especially among children by supporting schools with necessary infrastructure. Concord has installed e-smart classes in the neighboring village schools to improve the quality of education and for enhancement of their skills. 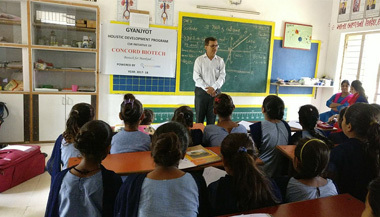 Concord also supports children from economically difficult backgrounds in IITs by providing scholarships. Gender Equality and Empowerment of Women: Concord conducts regular awareness programs at nearby communities to promote gender equality and empowerment of women. Environmental Sustainability: We carry out regular tree plantation programs to ensure environmental sustainability and ecological balance. We also carry out rainwater harvesting projects. Rural Development Projects: We are working with certain agencies to explore ways to strengthen rural areas by improving drinking water, hygiene and sanitation thereby creating sustainable villages. We are also looking at various livelihood projects in the rural areas to improve their standard of living.